Visit 26 August 1825 Commander Baron de Bougainville of the Frigate Thetis and Captain Du Campier of L’Esperance. Foundation stone laid 6 September 1825. 12 December 1828, Commander A Du Petit Thouars visited the monument in company wth J.H. Plunkett (Attorney General); C. Deas Thomson (Colonial Secretary), and Mr Therry (Assistant Public Prosecutor). Captain Mathieu was commander of the Rhin and the French Commisioner-General to the International Exhibition in Sydney. 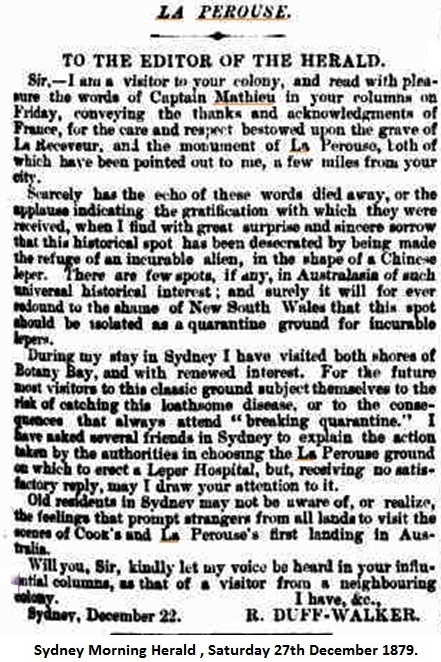 (From Freeman Journal, September 1879): Australia and France. 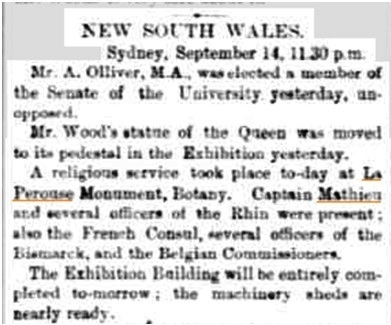 — On Thursday last week captain Mathieu and officers of the Frenchman-of-war Rhin, and the French Commissioners to tho International Exhibition, waited upon his Worship the Mayor of Sydney (Mr. C. J.Roberts), and the Aldermen of the city, at the Town Hall, for the purpose of returning the visit paid some days before on board the Rhin, and of presenting to the city a handsome Sevres vase, forwarded by the French Government as a souvenir of the interest which France takes in the Sydney International Exhibition and in New South Wales. The French flag was flying in front of the Town Hall throughout the day. The visitors having been received by the Mayor were introduced by him to the aldermen and the others present, and were then conducted into his’ Worship’s private room, where a light repast, elegantly laid, was in waiting. In proposing the toast of Captain Mathieu and his officers, the Mayor said, ‘ I am delighted to hear, as I am sure you all will be, that Captain Mathieu actually came to New South Wales to procure a partner for life.’ (Cheers and laughter.) We have been asked to state that this is not correct. Captain Mathieu’s first wife was an Australian lady, whom he married here some eighteen years ago. She is now dead, and he is married a second time to a French lady, who is still living at home in France. …………………………………. Adolphe Mathieu was born on 6 April 1827 in Paris. He was appointed midshipman on 16 August 1844; sub-lieutenant 1 October 1848, being then based in BREST. He was promoted lieutenant on 3 February 1855; commander on 7 March 1868, and captain on 29 January 1879. He retired in 1887 and, in 1888, he was appointed Director of the Orphans Establishment which position he filled until 1897. He served on board the sloops COETLOGON (1860-1865) and MARCEAU (1866-1868). He was posted to New Caledonia from 1868-1870. In January 1879, he was appointed a member of the High Commission for Submarine Defences and, later in that year, he commanded the corvette THETIS at Toulon. In January 1881, he was posted to the port of BREST. In January 1883, he appointed to command the MESSAGER, the School for Submarine Defences, at ROCHEFORT. In January 1886, he was appointed to command the School for Stokers at BREST. He was appointed chevalier of the Legion of Honour on 6 August 1858; officier on 27 December 1872; and commandeur 29 June 1886. He also held the Colonial Medal with clasps Nouvelle-Calédonie, Algérie, and Iles de la Société. Captain MATHIEU died in BREST on 7 September 1912. This screw transport was built in Rochefort. Laid down in October 1854, it was launched on 31 August 1855, and was fitted out for the first time in November 1855. The engine, of 230 h.p. which was built by Creusot, was installed between April and July 1870. The main dimensions of the vessel were: length: 71.90 metres; width: 12.90 metres; draught: 8 metres; displacement: 2916 tonnes. It carried two 14cm cannons as armament. In 1855, the Rhin made several voyages from Toulon to the Crimea and the island of Milo. In 1859, during the war in Italy, it carried out numerous crossings between France, Italy and Algeria. In December 1859, it left for China and returned to Rochefort in September 1862. At the end of 1862, it set sail for Alexandria and, from there, for Toulon where some repairs were carried out and it received new boilers. In August 1863, it left Toulon for the South Seas and from there for the west coast of Mexico. During the night of 3 February 1864, in the harbor of Mazatlan, it was struck by a violent gust of wind which drove it on to the rocks of Trestin Island; due to the serious damage caused by being driven ashore, it was towed to San Francisco by the frigate Victoire. It made several voyages afterwards to Guaymas, Acapulco, Mazatlan, San Blas; it called into Panama in December 1866, Callao in January 1867 and Valparaiso in March. 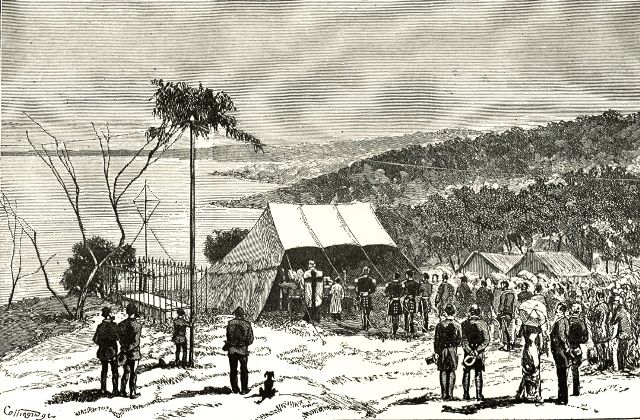 From there, it set off for Rio where it arrived on 3 May and left again on 9 May for Toulon where it arrived on 27 June 1867. It sent ashore its machinery and boilers and set course for Brest where it arrived on 15 April 1869. 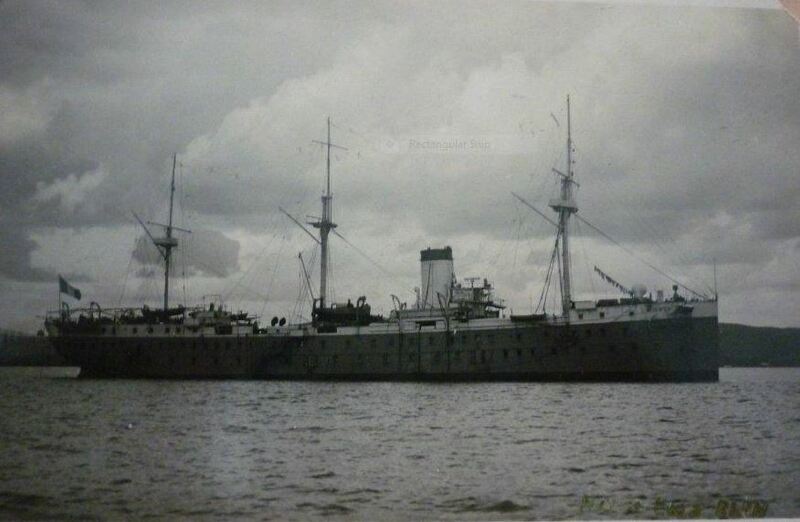 Here it was laid up, had a complete refit and received a spar‑deck, and the machinery and boilers from the Allier. In this refit, the sail plan was modified and set up in conformity with that approved on 25 August 1864 for the Meuse. In January 1872, the Rhin set course for Toulon where it took on board convicts and passengers for New Caledonia. It left for this destination in February 1872, passing through the Suez Canal, and reached Noumea in May. It returned to Rochefort via Cape Horn, reaching port in September 1872. In December 1872, it left again for Toulon where it again took on board convicts for New Caledonia and departed for this destination in January 1873. Going via Dakar, it reached Noumea and then returned via Cape Horn to Brest where it was laid up in September 1873. Fitted out on 2 August 1875, the Rhin left Brest on 1 September 1875 for Rochefort where it embarked convicts for New Caledonia. It set sail on 6 September 1875 and reached Noumea on 30 January 1876. It returned to Toulon via Cape Horn, reaching port on 24 October 1876, when it was laid up. The Rhin was fitted out again in Toulon in 1879 to carry French products to the Sydney Exposition. The ship returned from Sydney, via Cape Horn, to Toulon where it was laid up in March 1880. It was fitted out for one last time at Toulon in March 1885 to carry out voyages between Madagascar and Reunion; the upper and lower gun-decks were fitted with sleeping berths and planks for sleeping bags with a view to transporting passengers. Condemned by Ministerial decision of 5 June 1886, this vessel was used as a collier and a station for torpedo-boats of the 1st Ocean Flotilla at Lézardrieux until 1910, when it was sold.